You may be hearing about all these new “smart” thermostats lately. But, do you actually know what the difference between the regular thermostats, programmable thermostats, and smart thermostats is? And what does it mean when a thermostat has a remote sensor? Regular thermostats are control panels for your heating and air conditioning system which you use to adjust the temperature in your home. Programmable thermostats let you set up a heating/cooling schedule several days in advance and the thermostat changes the temperature for you. The most advanced thermostats are “smart” thermostats. They learn your preferred temperatures, adjust the temperature on their own, allow you to control the temperature in your home remotely, and even help you save some money. Most of the smart thermostats show you monthly energy consumption so you can decide if you are heating/cooling your home unnecessarily and eventually make some changes to receive smaller bills. To take that one step further, some smart thermostats can connect to remote temperature gauges and motion sensors. This lets the thermostat better understand the temperature in each individual room and adjust the HVAC system accordingly. What is the difference between a remote control thermostat and one with remote sensors? Remote control thermostats are connected to wi-fi and can be adjusted using a website or a smartphone app. Remote sensors are used to send temperature information to your thermostat so that it can adjust the heating/cooling based on the information it receives. Most thermostats are placed in the hallway and the temperature in the entire house will be dictated by the temperature of the room where the thermostat is placed. That is why the temperature in other rooms may be slightly different; you may end up with a very cold room and the thermostat will think the temperature is right. That is where a remote thermostat sensor comes in. You can place a sensor in a different room and it will send temperature and motion information back to the main thermostat. If you’re relaxing in your bedroom, and the living room is empty, the thermostat can adjust the settings so you don’t waste energy heating your living room. Thermostats with remote sensor ability are a much smarter way to control the HVAC system in your home. Why Are Remote Sensors Valuable? A wireless remote sensor is very useful for heating your entire home optimally and also saving energy. 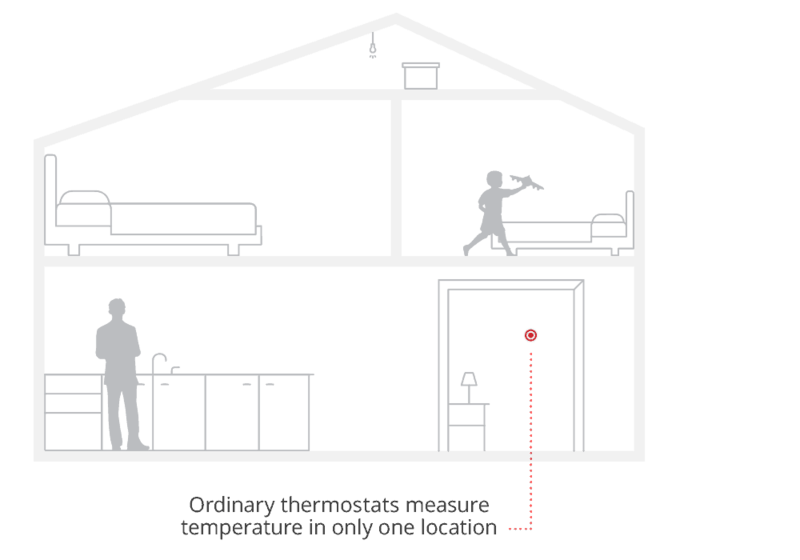 The sensors measure the temperature in several rooms and help address the troublesome hot and cold spots, keeping you comfortable all the time. Ecobee4 can support up to 32 sensors, so if you are lucky enough to live in a huge mansion Ecobee has you covered. 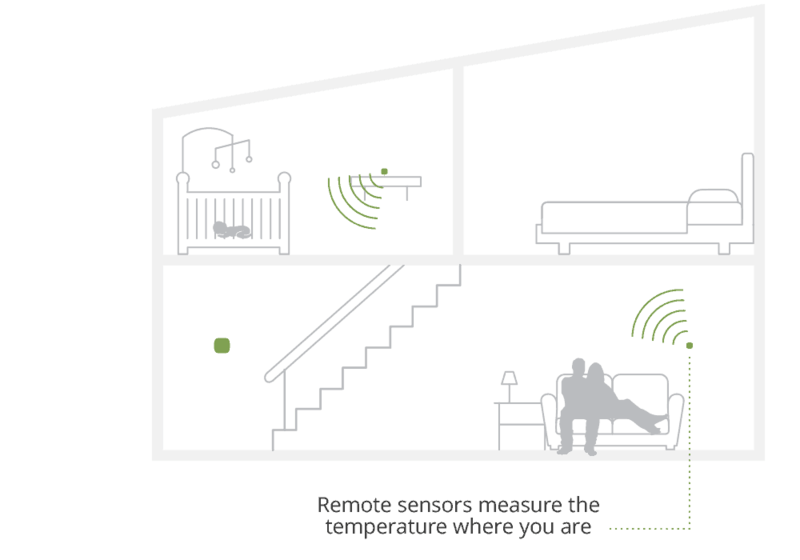 The remote sensors do not only measure temperature, but also occupancy. They determine which rooms have people in them to make smart heating and cooling decisions. Thanks to the sensors, you will be more comfortable when you are at home and save energy when you are away. The Ecobee4 remote thermostat sensors also know the difference between humans and pets, so your cat won’t be able to run up your electricity bill. Thermostat only includes one remote sensor. Other sensors must be purchased separately. The Ecobee4 offers more control than a Nest Thermostat. It works well for large houses because it allows you to control comfort settings for multiple rooms at the same time. The sensors allow you to buy one thermostat and additional sensors instead of purchasing multiple thermostat units. It learns your preferences, allows you to create custom schedules, can control every HVAC appliance in your home, and ultimately will save you money on your energy bill. 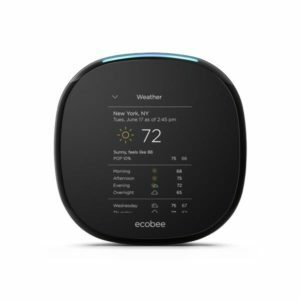 The Ecobee4 has the most advanced energy reports of all smart thermostats on the market. This feature is called Home IQ and can be accessed through the web console. Home IQ can store up to 18 months of data. 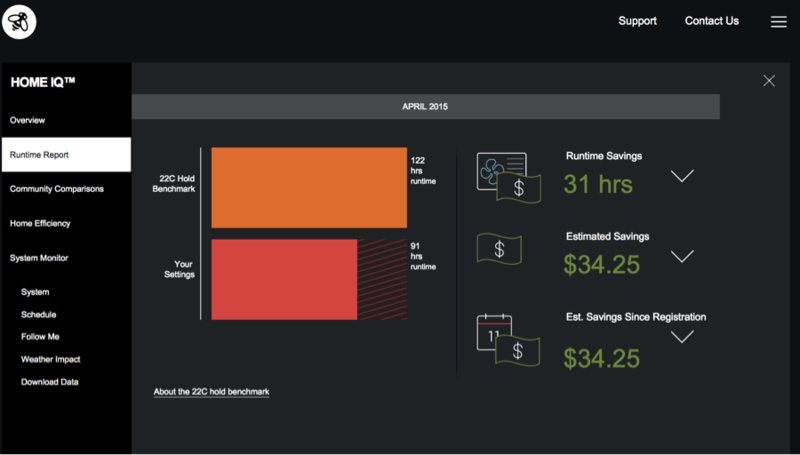 Home IQ has two amazing features – Runtime Report and Weather Impact. The Runtime Report is a monthly report that gives you an estimate of how much energy and money you saved thanks to your smart thermostat. The Weather Impact will show you how the daily temperature will influence the total run time of your HVAC system. Ecobee4 offers advanced fan control options to its users – fan circulate and fan dissipation. Fan circulate allows you to specify the number of minutes per hour you would like your fan to be turned on. Fan dissipation keeps the fan running for a set time after the heating or air conditioning turns off. The reason for this is because once the HVAC system shuts off, there is still some heating/cooling left. So, immediately shutting the fan would mean wasting a small amount of energy. Ecobee4 allows you to adjust the amount of time the fan will run (for both options), unlike many other modern thermostats. The smart home and smart away features are possibly the most advanced features of Ecobee4. The thermostat uses its sensors to determine if there is anyone present at home and then adjusts the temperature accordingly. Before using these features, you should set up a weekly schedule and let your thermostat know what times will you most likely be at home or away. However, if the Ecobee4 senses that you are away during a scheduled “at home” period it will switch to away mode since there is no sense in cooling/heating an empty house. This feature also works vice versa, meaning that if the sensors detect you during the scheduled “away” period, the thermostat will make sure to create a comfortable environment. The Ecobee4’s interface is incredibly easy to use both for the thermostat and the app. The sleek design is modern without being obnoxious. It looks great in homes decorated in any style, from mid-century modern to shabby chic. Making any adjustments to this thermostat is a piece of cake with the 3.5” LCD touchscreen. In addition, the display also features smart controls and icons, making the thermostat easy to read and easy to use. In most cases, a thermostat with remote wireless sensor function also has the remote control option. This means that even though sensors will do all the work for you, you can still change your settings remotely by using an app. The big advantage of the Ecobee4 is the greater control over the temperature in your home. This makes the home comfortable in every room. It allows you to monitor both humidity and temperature. And ultimately it saves you energy, which is good for the environment and great for your bank account. If you want to learn more about the other smart thermostats on the market and see how the Ecobee4 compares you can check out our guide to smart thermostats. Up until recently, Nest thermostats had one major disadvantage; unlike the Ecobee thermostats, they didn’t have the support for temperature sensors. 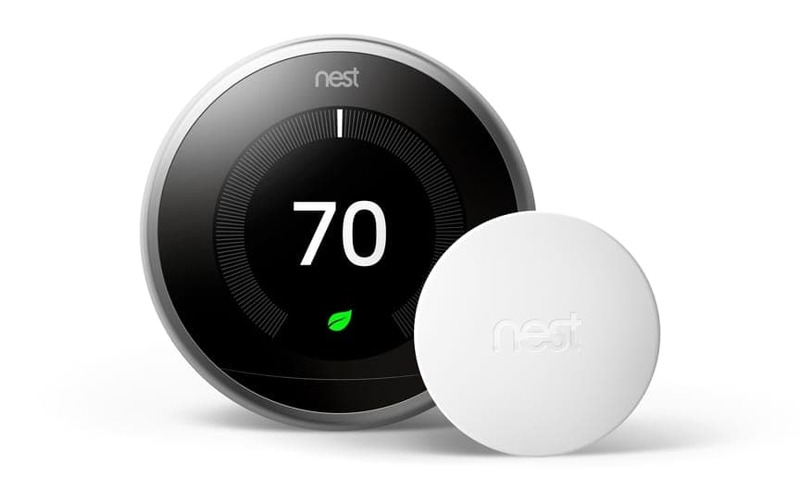 As of April 2018, a new Nest product appeared on the market – a temperature sensor which is compatible with Nest Thermostat E as well as the 3rd gen Nest Learning Thermostat. You can purchase a single sensor for $39, a pack of three sensors for $99, or even choose a bundle that includes one of the mentioned thermostats and temperature sensors. In the majority of homes, the temperature varies in each room. Sometimes, your living room can get too warm while your bedroom remains too cold. Nest wireless remote sensors allow you to set the desired temperature during a certain time of the day in up to six rooms. This means that you can put up to six sensors in your home and schedule each of them according to your needs. The sensors allow your thermostat to use the temperature in different rooms as the baseline instead of the temperature that your thermostat’s sensor manages to pick up. One downside to the Nest remote thermostat sensor is that it doesn’t contribute to the Home/Away Assist feature. This feature automatically adjusts the temperature in your home based on your location. Unfortunately, the Nest sensors do not have proximity detectors meaning that they cannot notify your thermostat if you’re at home or away. Nest is well-known for developing smart devices which look incredibly good and fit in every home. Nest Temperature Sensor features a round design and mimics the shape of the Nest Learning Thermostat. The device is covered with soft-touch, matte plastic which looks good and feels solid at the same time. The back of the device is rubberized to ensure that no marks remain on walls once the device is installed. In addition, the rubberized back also serves as a grip if you decide to place the device on a flat surface. Installation of the Nest Temperature Sensors is incredibly simple. All you have to do is identify the sensor by scanning a QR code which can be found inside the battery cover. Then, you choose the room where the sensor will be placed and the Nest app takes care of the rest. Once you connect and activate your sensors, you can access remote temperature reading in the Nest app. 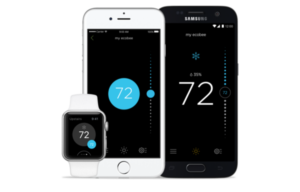 The app will allow you to toggle between the temperature of your programmable thermostat and your remote sensors. The Nest app doesn’t only allow you to control your thermostat manually but also to schedule your thermostat to respond to all of your sensors during the day. You can create a schedule to ensure the temperature in each room is comfortable according to the time of the day when it will be most likely in use. The manufacturer allows you to choose one or more of the following time slots for each sensor: morning (7-11 a.m.), midday (11 a.m. to 4 p.m.), evening (4 p.m. to 9 p.m.), and night (9 p.m. to 7 a.m.). Up to six sensors can be connected to a Nest thermostat. There are no proximity sensors for detecting motion. The sensors only work with the third-generation Nest Learning Thermostat and Nest Thermostat E.
Nest made the original wi-fi thermostat and changed heating and cooling as we know it. But after a few years they had some tough competition. 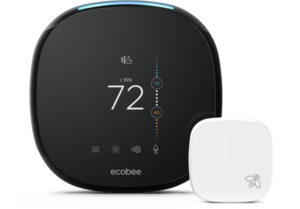 Ecobee was one company whose thermostats went above and beyond the Nest models from a technology perspective. Nest was caught off guard. As of Winter 2018, there is no Nest thermostat with remote sensors. The company announced its plans to develop a Nest Remote Sensor but so far we have not seen a new product hit the market. When Nest finally brought their remote sensors to the market it was pretty underwhelming. The sensors are not backwards compatible with the 1st or 2nd generation Nest thermostats, they only work with 3rd generation thermostats or the low-cost E model. They’re powered via Bluetooth so they only have a range of 50 feet. Where Ecobee built a system to monitor control the temperature of your home holistically, Nest built an add-on sensor that helps you out if your thermostat is placed in an inconvenient place in your home. Nest still would prefer you buy multiple thermostats instead of adding multiple zone control, which is a shame. Because of this, we think the Ecobee4 is the best thermostat with remote sensors and the best smart thermostat for large homes. If you tend to judge products based on their design, then this Honeywell programmable thermostat will definitely not get on your shortlist. The Honeywell FocusPRO has a traditional rectangular shape and a boring monochrome LCD display. The reason behind this is probably because the FocusPRO line isn’t brand new. The manufacturer simply upgraded it by adding the wireless option to the models that can be programmed. You can create different schedules for weekdays and weekend, or create a different schedule for weekdays, Saturday, and Sunday. What this unit lacks in design it definitely makes up in functionality. 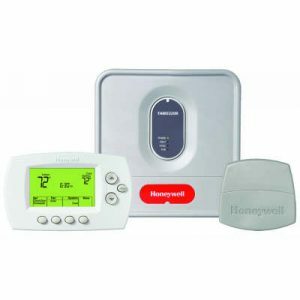 The Honeywell Wireless FocusPRO Kit includes the FocusPRO 5-1-1 Programmable Thermostat, Equipment Interface Module, and Return Air Sensor. Thanks to the addition of a RedLINK Internet Gateway homeowners can remotely monitor and control their heating and cooling system. Since the unit is wireless you can use it to solve any problem from anywhere. In addition, this kit is compatible with other smart home integrations such as Amazon Alexa and Google Home. RedLINK Internet Gateway allows you to connect your device to the Internet and control it remotely by using your PC, smartphone or tablet. The manufacturer developed accompanying software, Honeywell Total Connect system, that sends users alerts and helps them control their home temperature at all times. In addition, the app doesn’t only allow the user to monitor and control their HVAC system but also humidifiers and dehumidifiers if there are any. The Wireless FocusPRO makes it possible for you to install your thermostat anywhere, not only in your hallway or other rooms where you don’t spend much time because of the complicated wiring. The installation of the unit is incredibly easy –the installation is done at the Equipment Interface Module by the unit itself. This feature makes adding cooling or multi-stage system a breeze. The RedLINK Wireless Outdoor Sensor enables your thermostat to display outdoor temperature and humidity. The sensor is installed easily – all you have to do is attach it with two simple screws and press a button that will initiate wireless installation. The sensor comes with a weather-resistant cover and lithium batteries that provide reliable performance. The battery life is up to five years. Thanks to the Wireless Outdoor Sensor, the owners can make temperature adjustments in their home base on informed decisions and improve their energy savings. For example, if it is cooler outside than inside, homeowners can turn their HVAC system off to save energy. The batteries that come with your Honeywell FocusPRO can last for a year. But, in case you don’t notice that the batteries are out or perhaps you forget to change them, this thermostat has got you covered. Thanks to the Return Air Sensor which works with the Equipment Interface Module, the unit is still capable of maintaining comfortable indoor temperatures – 62℉ for heating and 82℉ for cooling. Simple to use and easy to install. Compatible with Honeywell’s Total Connect system. Displays outdoor temperature and humidity. A wireless unit which allows remote control. The thermostat is programmable and allows users to create their own schedule.